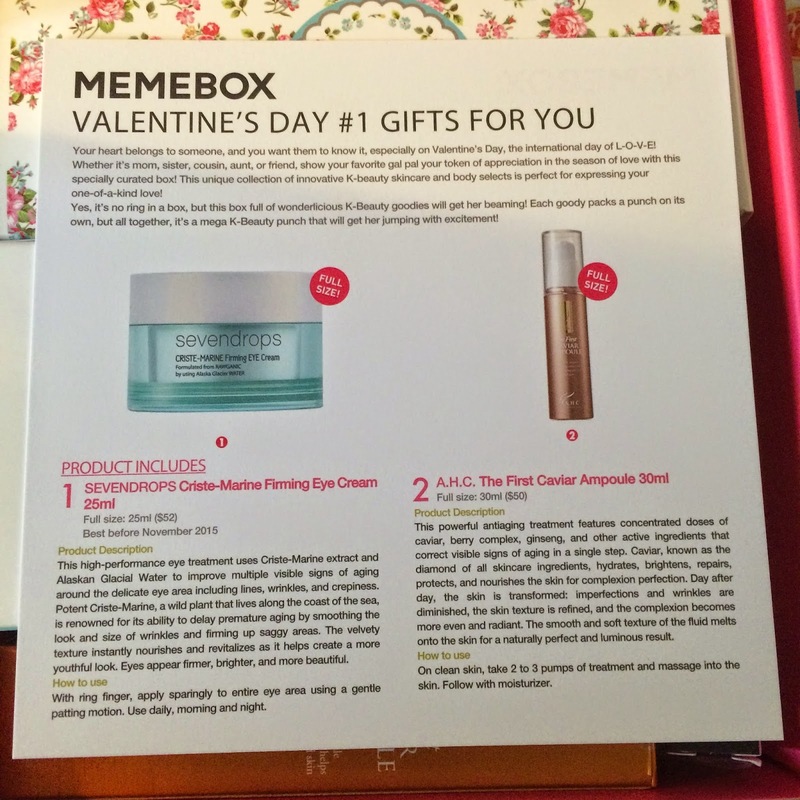 "Valentine's Day Box #1: Gifts For You" was part of a trio of boxes that become the last international boxes available from Memebox. 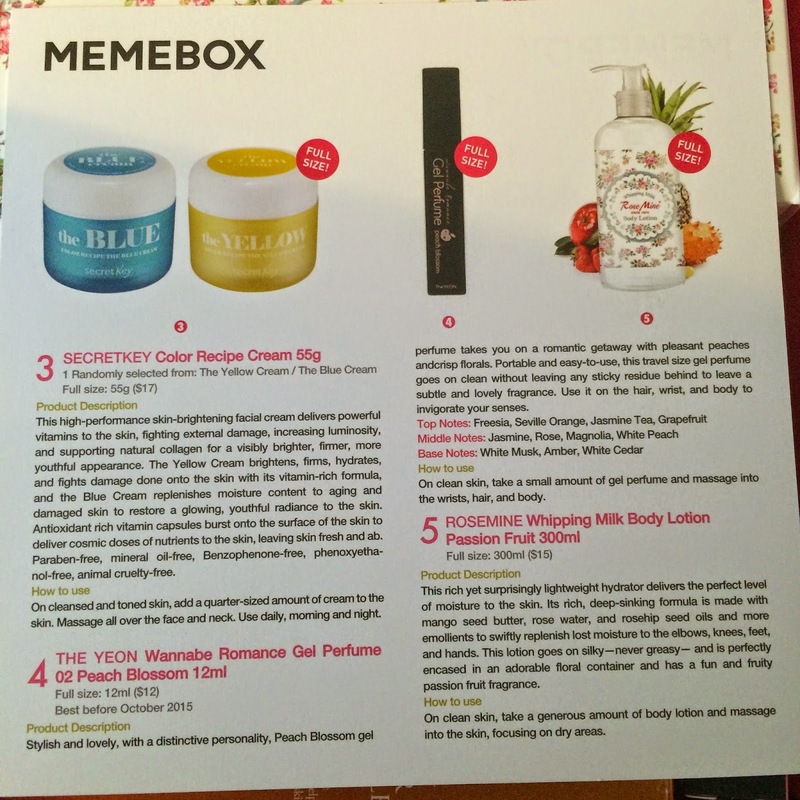 I ordered all three in the hopes that they would be something special and reminiscent of the thoughtful and well collaborated boxes that first drew me into Memebox. In this post, we'll take a look at the contents of the Gifts For You box and what I think it looks like as a whole. This high performance eye treatment uses Criste-Marine extract and Alaskan Glacial Water to improve multiple visible signs of aging around the delicate eye area including lines, winkles, and crepiness. Potent Criste-Marine, a wild plant that lives along the the coast of the sea, is renowned for its ability to delay premature aging by smoothing the look and size of wrinkles and firming of saggy areas. The velvety texture instantly nourishes and revitalizes as it helps create a more youthful look. Eyes appear firmer, brighter, and more beautiful. How To Use: With ring finger, apply sparingly to entire eye area using a gentle patting motion. Use daily, morning and night. This cream is very thick and rich - which is something I used to love in an eye cream, but recently I've developed milia in my eye area that worsens with the use of eye creams and forces me to use gels or serums instead. This cream has a very plain lotion scent in the jar, but when I rubbed a tiny amount into my had I swear it smelled like licorice. I found it to be very hydrating, and am very sad that I am unable to use it. This powerful anti-aging treatment features concentrated doses of caviar, berry complex, ginseng, and other active ingredients that correct visible signs of aging in a single step. Caviar, known as the diamond of all skincare ingredients, hydrates, brightens, repairs, protects, and nourishes the skin for complexion perfection. Day after day, the skin in transformed: imperfections and wrinkles are diminished, the skin texture is refined, and the complexion becomes more even and radiant. The smooth and soft texture of the fluid melts onto the skin for a naturally perfect and luminous result. How To Use: On clean skin, take 2 to 3 pumps of treatment and massage into the skin. Follow with moisturizer. This ampoule sounds like heaven in a bottle, doesn't it? It's honestly everything I've been looking for in the anti-aging component I'm wanting to add to my skincare routine - but the ingredients list stopped me in my tracks. The product contains denatured alcohol as its fourth ingredient, which means an acne party for me if I use this. Unfortunately this will be passed along. This high-performance skin-brightening facial cream delivers powerful vitamins to the skin, fighting external damage, increasing luminosity, and supporting natural collagen for a visibly brighter, firmer, more youthful appearance. The Yellow Cream brightens, firms, hydrates, and fights damage done onto the skin with its vitamin-rich formula, and the Blue Cream replenishes moisture content to aging and damaged skin to restore a glowing, youthful radiance to the skin. Antioxidant rich vitamin capsules burst onto the surface of the skin to deliver cosmic doses of nutrients to the skin, leaving skin fresh. Paraben-free, mineral oil free, benzophenone-free, phenoxyethanol-free, and animal cruelty free. How To Use: On cleansed and toned skin, add a quarter-sized amount of cream to the skin. Massage all over the face and neck. Use daily, morning and night. I received the Yellow Cream, which is actually a gel and not a cream. The capsules in the gel look like bits of gold but they do seem to disappear when massaged with the gel into the skin. I find the gel to be moisturizing enough for my oily skin, but I also find the gel to be heavily fragranced and have a feeling this will be an allergy trigger for me. I'm also concerned that part of the fragrance I'm picking up is alcohol, which means I will break out if I continue to use this product. So I'm not sure what this items fate will be with me. Stylish and lovely, with a distinctive personality, Peach Blossom gel perfume takes you on a romantic getaway with pleasant peaches and crisp florals. Portable and easy to use, this travel size gel perfume goes on clean without leaving and sticky residue behind to leave a subtle and lovely fragrance. Use it on hair, wrist, and body to invigorate your senses. How To Use: On clean skin, take a small amount of gel perfume and massage into the wrists, hair, and body. This perfume smells so fresh and sweet - it's perfect for the impending spring weather! I love how portable it is, I can keep it in my purse without worrying about it spilling or leaking. This really is an ideal applicator for scents, I just wish the scent lasted longer on my skin. This rich yet surprisingly lightweight hydrator delivers the perfect level of moisture to the skin. Its rich, deep-sinking formula is made with mango seed butter, rose water, and rosehip seed oils and more emollients to swiftly replenish lost moisture to the elbows, knees, feet, and hands. This lotion goes on silky - never greasy - and is perfectly encased in an adorable floral container and has a fun and fruity passion fruit fragrance. How To Use: On clean skin, take a generous amount of body lotion and massage onto the skin, focusing on dry areas. This has the cutest packaging of any larger body lotion I've ever seen - the floral design is simply beautiful. This lotion is very rich and creamy, but absorbs quickly. It smells of mango with a light rosey floral undertone. I am in love with this lotion, this is my favorite item from this box! This box is honestly a perfect "Gifts For You" box in the sense that all the products are straight forward and nothing is bizarre or too strange for someone unfamiliar with k-beauty. If you were to really give this box as a gift, I think the recipient would be quite pleased. The body lotion won this box over for me.